Hi everyone! I'm so excited about our new challenge happening right now at 7 Kids College Fund Challenge Blog. I'm sure you've noticed hexagons popping up all over the crafting world right now from pattern papers, stamps & embellishments! I've used pattern paper and embellishments in my project today as we're asking YOU to use HEXAGONS to join us in the challenge this week. 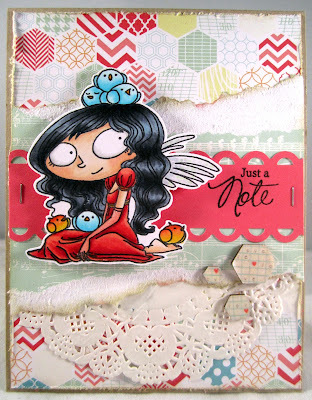 I'm new to Kraftin Kimmie stamps and I'm totally head over heels in love with them. I only have 2 at the moment but that is DEFINITELY going to change soon! You can see all the Kraftin Kimmie Stamps that 7 Kids College Fund carries HERE. I hope you'll join us in the challenge - as always, up for grabs is a $20 shopping spree to anything 7 Kids College Fund carries!! 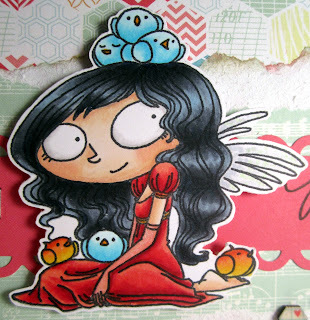 Here is a close up of the image I colored using Copics. I also listed what the colors I used below! I have to admit, I was a bit unsure whether to color her eyes or not, it just felt off leaving them stark white with every thing else so I did give a light shadow using T1/T0 just to give them a little bit of depth. I'm pleased with how it turned out. I couldn't have done it without the help of the amazing fans we have on the Designed To Color Facebook page - if you haven't followed us there, I hope you will!! It's a fun place to be! omgosh hun that is too cute. I love this hexagon paper, have a couple of sheets somewhere so I might have to dig them out!! 7 Kids College Fund Whimsy Stamps Blog Hop! !